For the month of February, I invite you to join me in an adventure. Let’s look for ways to love our ordinary – not just love our ordinary tasks and routines, but look for ways to love God and love others through the ordinary parts of our days. It’s a lesson I’ve been learning since last fall, and God has used this to transform my everyday life. I’d love to learn from you and go on this adventure together. What better month to look for ways to love than February? Sometime between the summer sunshine and the rhythmic routine of the school year, I’d lost my way. One evening, as the trees painted a flaming skyline, my soul felt charred, as though all life had burned away. The meltdown came over dishes. “I’m smarter than this! The things I do all day are so meaningless!” I plunged the dishcloth back into the sink sending suds flying across the counter. A never-ending list of laundry, cleaning, meals, supervising homework, meeting writing deadlines, and running errands clogged my days. It all felt pointless, like my life was stuck on a treadmill to nowhere. I had no idea. Absolutely no idea. A few weeks after my mini-meltdown, Kedron was diagnosed with cancer. For the week of his surgery, my parents came to stay with us and took care of packing lunches, walking kids to the bus stop, supervising showers, cleaning, laundry, and dishes. They assumed my list of “meaningless” tasks. Their presence was a gift. While I focused on caring for Kedron, my parents kept things running smoothly at home for the kids. I realized how much the ordinary matters matter. God confronted me with my own selfishness and pride. I have the privilege of serving my family every day. Rather than doing so out of a grateful heart, I’d been doing so with dread and resentment. After reminding his readers of all that Christ had done for them, Paul urged the Colossians to live differently than the rest of the world. The phrase, “work at it with all your heart” rang in my depths. I was guilty of just doing it to get it done, and often with a grudging spirit. Rather than mindlessly folding the laundry and wishing the task away, I paused over each item. Each article of clothing revealed something unique about the owner. Fabric worn thin in T-Rex’s jeans showed his reckless abandon. Little Miss’s neat and never-stained clothes revealed her cautious nature and her preference to read rather than run wild outside. As I folded Kedron’s shirts I noticed that each one was either V-neck or button up, a necessary comfort after surgery. With each fold and crease of the fabric, I piled up prayers and gratefulness for the people who wore the items in my laundry basket. The mundane became meaningful because of the people I was loving and serving through my actions. I realized I don’t have to just go through the motions of a task. I can bring meaning to the motions. I’d purchased the lie that my purpose is found in the tasks I perform. I’d paid the price with my happiness and contentment. But when I lived through the lens of God’s love first –I saw that my work doesn’t define me. I’m already defined by God’s love for me. I can live out that love wherever I go, whatever I do. It’s an adventure, looking for love in the ordinary. We’re often a culture obsessed with the sensational, but most of life consists of routine things. Why not make them an adventure? This week, take an ordinary task, something you maybe dread, and ask God to help you learn to love the task and show you how to love Him and others while you do it. Maybe it’s not laundry, but a report you do each month, or your daily commute, or a middle of the night waking with a child. Whatever it is, look for a way to love it and love others through it. I’ll be using the hashtag #LoveYourOrdinary on social media. As you find ways to love your own ordinary, please share with us by using the hashtag on your social media. Next Monday, you can share your stories by linking up on my blog, or sharing something in the comments. 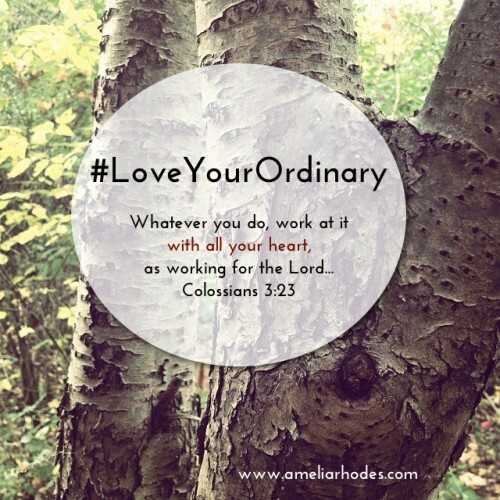 I can’t wait to hear about how God prompts you to #LoveYourOrdinary this week! How do you #LoveYourOrdinary ? Linking with Jen and the SDG sisters! I keep trying to persuade my boys that their work is a praise gift to God – they’re not buying it yet – but if I keep saying it . . . . I am learning to bring Him into it – to pray for others over my work – and it does change it! Hope your husband is on the road to recovery – and that your family is doing well. Thank you for sharing your heart here! Thank you! I’m always amazed at how small little shifts, praying for others, looking for small ways to love others really does change the ordinary. I think because God changes me through it too! Thank you for the reminder that we can find meaning in ordinary tasks. It was just what I needed to read today. Much love to you Jennifer! I love this. It’s so very hard for me to remember sometimes. It does matter, so much. Lisa, I sometimes think that remembering is the hardest part. I find the actions often flow naturally, if I can just remember to be present and aware in my ordinary! I remember ready how Ruth Graham had a prayer she prayed while she washed dishes. One similar to the one my mother in law had hanging from her kitchen. I saw my mother in law in action make everything she did important – it really didn’t matter what it was. Feeding hungry men on a day when they’re bailing day, feeding a baby deer from a bottle in her breezeway, or holding a baby. Every ordinary thing she did somehow seemed sacred. Thanks for the reminder. Brenda, this is so beautiful! Thank you for sharing these amazing memories of her. I want to grow into that kind of woman! There is beauty in the ordinary, just as there is in the extraordinary. You have learned to see both.